High-performance video processing demo will run for duration of show and demonstrate how you can go from data to decision. As these systems accelerate and evolve, sensor and data processing requirements challenge the performance envelope of small form factor, ruggedized, high performance computing solutions. ADLINK Technology, a global provider of leading edge computing solutions that drive data-to-decision applications across industries, together with LCR Embedded Systems, will showcase an integrated demonstration with SWaP-optimized, rugged unmanned systems preprocessing, communicating and distributing real-time data to decision makers. The demonstration takes place in Booth 306 at AUVSI XPONENTIAL 2017, May 9 – May 11, at Kay Bailey Hutchison Convention Center in Dallas, TX. The demonstration will consist of two connected SWaP/C-friendly rugged systems suitable for deployment on unmanned vehicles, one from ADLINK and one from LCR Embedded Systems. A drone-mountable camera will be connected to the ADLINK HPERC™ system utilizing PrismTech’s Vortex DDS software, enabling the camera to capture, track, and transmit several targets simultaneously. This information will then be transmitted in real time to LCR Embedded Systems’ recently announced Featherweight VPX System, powered by Intel® Xeon® D processor, illustrating communication to a receiving system where it can be further processed and distributed. 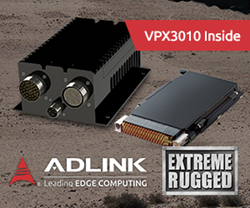 Learn more about ADLINK’s Extreme Rugged™ services. LCR Embedded Systems designs, develops, and manufactures rugged and lab-grade chassis, backplanes, and fully integrated systems for the aerospace and defense, commercial, rail, and industrial markets with a focus on standards-based form factors such as VPX/VME, AdvancedTCA, COM Express, and CompactPCI. LCR Embedded Systems is an AS 9100 C and ISO9001:2008 certified company, with approved J-STD-001 Class 3, CCAP, FOD, and ESD programs in place. ADLINK Technology is leading edge computing with solutions that drive data-to-decision applications across industries. Our products include motherboards, blades, chassis, modules, gateways, systems and end-to-end solutions based on industry standard form factors. Many products are Extreme Rugged™, supporting extended operating temperature ranges, and MIL-STD levels of shock and vibration. ADLINK is active in several standards organizations and interoperability initiatives. For more information, please visit http://www.adlinktech.com.